Passport challenged Jim Vision to capture the free-spirited and colourful essence of the brand using street art on a single canvas. Known for his bold compositions and high level of detail, Jim was given the freedom to experiment with different materials to express his interpretation of what Passport means to him; the result is a striking piece of street art that forms the basis of the #UrbanArtProject campaign. The campaign has been brought to life through a limited edition bottle with standout shelf-appeal. Wrapped in Jim’s original artwork, the Passport Scotch #UrbanArtProject limited edition bottle is set to engage with millennial consumers in five markets, including Spain, Portugal, Bulgaria and Poland from this month. Mark Thorne, Passport global brand director, comments: “In 2015, Passport Scotch earned its position as the fastest growing blended Scotch that sells more than 200,000 cases per annum, which is confirmation of the great successes that we have seen in encouraging our consumers to unleash their curiosity and explore the world around them with Passport. Urban art is an integral part of our cities, so we see it as a natural fit for Passport Scotch as it really allows us to push the boundaries of creativity in the whisky category. 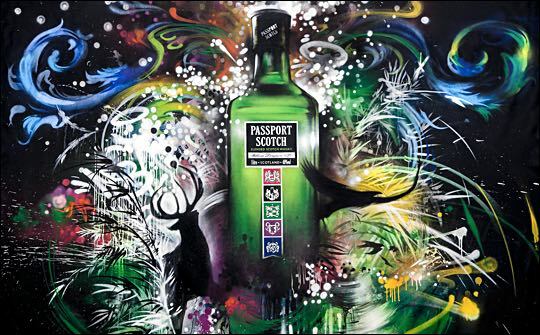 Click here to watch the creation of the Passport Scotch #UrbanArtProject mural. Crafted for the first time in 1965, Passport is an unconventional blended Scotch whisky with an original taste profile and a fruity, creamy finish that is increasingly popular among millennial consumers in emerging Scotch markets around the world. The No.2 standard Scotch whisky in Brazil and performing strongly in Angola, Mexico, Spain, Portugal and Poland, Passport grew +20% in net sales to reach a record 1.7m cases in the year ending in June 2015 – helping to earn its position as the fastest growing blended Scotch that sells more than 200,000 cases per annum.